On a dramatic cliff overlooking the stunning Sol d’en Serra bay, situated next to cala llonga Ibiza is Amante Beach Club. A relaxed beach club during the day offering lunch, and fine dining restaurant with a mouth-watering selection of contemporary Mediterranean dishes on the menu in the evening. Its well worth visiting during your Ibiza Holiday. 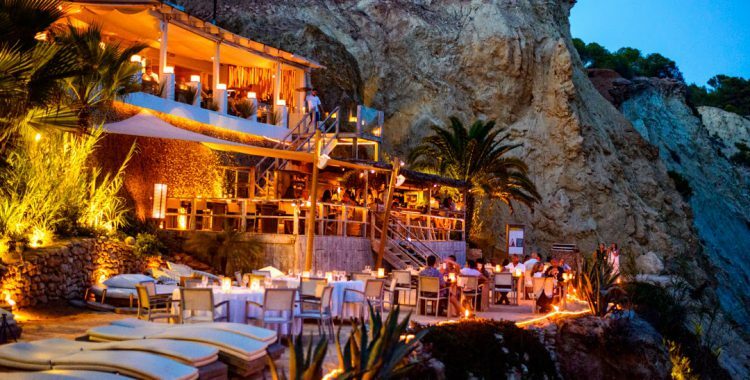 The Amante beach club and restaurant is perched on a cliff overlooking the stunning Sol D’en Serra bay, one of the most beautiful coves on the east coast of Ibiza. Surrounded by dramatic rocks and lush greenery, it provides an idyllic backdrop for long daytime lunches. But in the evening its fine dining in the sea breeze, overlooking the moonlit sea. From May to mid September, Amante is open every day from 11am for tapas with full menu available from 1pm until midnight. Don’t miss their amazing opening and closing parties! legendary among Ibiza regulars and Islanders! If you haven’t found the perfect Ibiza villa Holiday rental among our selection, please email Julia@ibizavillasdirect.com – some licensed villas are not featured in our selection, but we have the perfect villa for you!